The unique properties and look of the ostrich hide has made it a popular choice for modern design in upholstery, handbags and trims. Ostrich is a soft and pliable material that is naturally oily. Over time, the skin gets softer and more brilliant as it absorbs oils. that gets softer over time as it absorbs more oils from skin and material it comes in contact with. The tanning process is intricate and great care is taken to produce a high grade skin free of scar tissue, discoloration or to create holes where the pock marks should be. All of our skins are tanned by artisans with many years of experience in tanning ostrich hides. These professional tanners have developed methods to produce high quality and brilliant skins in a wide variety of colors (our most popular colors and demonstrated in the slideshow above.) 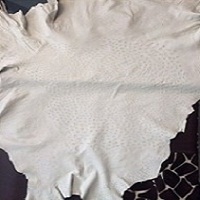 Ostrich hides are great luxury material for many applications where the surface area of a project utilizes the full width of the skin without requiring seams or trims. Seamless applications of a single luxury hide gives an amazingly beautiful look while the use of a single full ostrich hide across the full width greatly enhances the value and luxury appeal. Size: Approx. 2 Yard (About 8 sq. ft has the signature quill pocks) The rest of the Ostrich texture is a smooth, flexible and soft leather. Popular Applications: Handbags, wallets, car interior upholstery, boots, motorcycle seats, saddles, and inlays.